Several years ago, Microsoft bought a company called Skype that offers a very slick online service combining conference calling, video chat, instant messaging, and other kinds of collaboration tools. Little by little, Microsoft has brought Skype into the Microsoft Office family in order to make it easier to connect far-flung coworkers who want to get things done. Before you can set up.,/ or use Skype meetings, you need to open the Skype for Business application that’s already on your computer as part of the Microsoft Office suite and log into Skype. In most cases, your Windows logon information will get you into Skype. Otherwise, check with your system administrator to find your logon information. If you have Skype running on your computer, you can turn Skype into your virtual conference room when you set up a meeting through Outlook. There’s even a Skype button on the New Meeting form. If you click that button while you’re setting up a meeting, a link labeled Join Skype Meeting appears in the body of your meeting invitation. That’s all you need to do to create a Skype meeting. It’s so simple, it’s almost hard to believe. 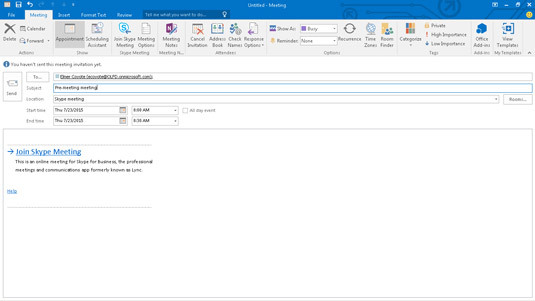 Creating a Skype meeting in Outlook is as simple as clicking the button labeled Join Skype Meeting. The only thing easier than setting up a Skype meeting is joining one. When the time for your meeting arrives, just go to your calendar and double-click the appointment to open it. Click the link labeled Join Skype Meeting and you’ll automatically be taken to the Skype program and an audio conference will already be started. Skype turns your computer into a speakerphone and video conference system. If you hear people talking, just speak up and join the conference. When you’re done with your conference, close Skype by clicking the X in the upper-right corner of the Skype screen.